MANILA, Philippines - The Professional Regulation Commission (PRC) officially named the topnotchers or top 10 passers for April 2017 Electronics Engineer (ECE) and Electronics Technician (ECT) board exam as results were released on Friday, April 7, 2017 or in three (3) working days after the exam. 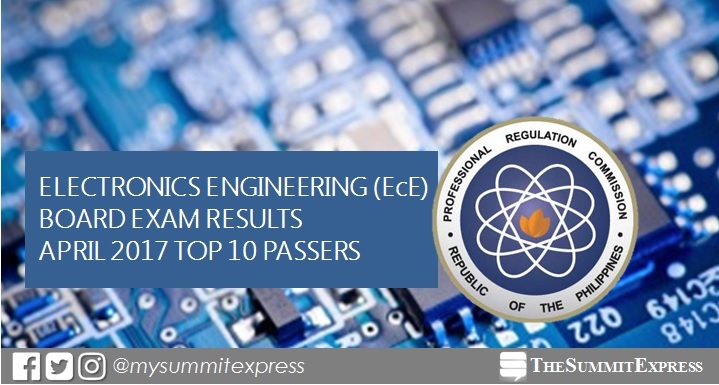 The Board of Electronics Engineering (BEE) conducted the licensure exam on Sunday and Monday, April 2 and 3, for Electronics Engineer (ECE) and April 4 Electronics Technician (ECT) in the cities of Manila, Baguio, Cebu and Davao. Aaron Maca-ayong Polancos from Mapua Institute of Technology (MIT) - Manila topped the ECE board with 88.80%. Joseph Alexander Philip Zaldarraiga Lacson of University of Saint La Salle (USLS) and Joshua Maurice Fabillar Plameras from Mapua Institute of Technology (MIT) - Manila led the passers for ECT, 92%. Barring unforeseen circumstances, 3 working days is the total number of days before the release of results based on the previous examinations. Meanwhile, below data is the quick overview of previous examinations for ECE and ECT. In April 2016, Paul Esteban Quibuyen of University of the East (UE) - Manila aced the ECE board exam with 89.30%. It was followed by Charleston Dale Macutay Ambatali of University of the Philippines (UP) - Diliman and Arvie Mae Trinidad Calimlim from Saint Louis University (SLU) who have tied on the second spot, 87.80%. Meanwhile, Robin Mon Rivas Miranda of Polytechnic University of the Philippines (PUP) - Sta. Mesa topped the ECT board with 94.00%.